What is Hamilton Web CapTel? Along with the use of any telephone (i.e. landline, office, mobile phone), Hamilton® CapTel® allows you to see every word a caller says on your computer screen. There’s no special equipment or software to download. All that’s required is an Internet connection, standard web browser1 and a Hamilton CapTel account. If you already have a Hamilton CapTel account, you can get started with Web CapTel right now. Hamilton Web CapTel includes a “Contacts” tab in the main menu. This is your personal phone book where you can add and edit your personal telephone numbers for one-click dialing. So, there’s no need to search for your best friend’s phone number. Just save it with Hamilton Web CapTel and call them whenever you want to say “hello”! 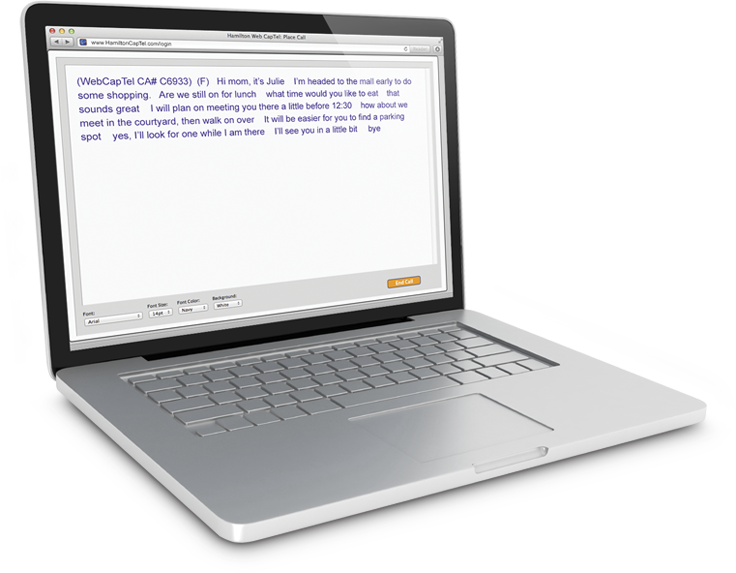 Register for a Hamilton CapTel account to ensure your web captioned calls are placed securely and accurately. This simple, one-time process will allow you to place and receive captioned calls any time you are logged in with Hamilton CapTel. After you have registered with an account, you will be ready to make and receive calls immediately. 1Generally, Hamilton CapTel will work on Internet browsers running the latest publicly available version. There may be older versions that are no longer supported and, in some instances, current versions that are not yet supported. Please contact a Hamilton CapTel representative if you have any questions about the compatibility of your current browser version with Hamilton CapTel. 2Hamilton CapTel may be used to make 911 calls but may not function the same as traditional 911 services. Find out more information about the benefits and limitations of Hamilton CapTel and Emergency 911 calling.